VANCOUVER – On Jan. 8, Anne McEnerny-Ogle was sworn in as the new mayor of Vancouver. She begins a four-year term as mayor for the city, and recently outlined some goals for her term as well as challenges Vancouver is facing. 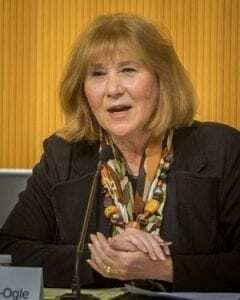 McEnerny-Ogle, who becomes Vancouver’s first female mayor, has lived in the city for 37 years, and during that time she has become involved in neighborhood association activities. She has also been involved with various nonprofits and community groups in her time in Vancouver. She also served on Vancouver’s planning commission, and ran three times for the city council. On the third campaign, McEnerny-Ogle was elected to the city council and began her first term in January of 2014. In January of 2016, she was voted by the council to be the mayor pro-tem, and then won the mayor position in the Nov. 2017 election. In Vancouver, the entire voter base elects the mayor to serve a term of four years. The city council serves as the policy making body in the city, and directs the city manager, Eric Holmes, to find ways to enact the policies chosen by the council. McEnerny-Ogle said that the mayor in Vancouver “does very little on her own,” rather, the job centers around “consensus building.” For any policy to be enacted, it must be approved by four council members before direction can be given to the city manager. The mayor also has the authority to place items on the agenda, but McEnerny-Ogle said that council members have that authority as well so long as two council members introduce the proposal. McEnerny-Ogle said that her main focus as a mayor interacting with the city council is to help the other council members accomplish their own projects. “For me, as the mayor, it’s to help my colleagues with their goals,” McEnerny-Ogle said. At the beginning of the new year, McEnerny-Ogle said that the main priority of the city council is to fill the vacant council position left by Scott Campbell, who passed away in September. According to McEnerny-Ogle, the council is still in the preliminary stages of filling that position. Applications are open until Jan. 18. As the mayor, McEnerny-Ogle said that she serves a city that is experiencing a large amount of new development and growth. She pointed to development on the waterfront where a new pier is being constructed and several restaurants are currently being built as indicators of “great opportunities of waterfront development” over the next year. McEnerny-Ogle said that there are currently 129 projects in Vancouver either in pre-application phases, under review or under construction as 2018 begins, and she is excited for the future of development in the city. C-TRAN’s bus rapid transit system, also known as The Vine, recently celebrated its first anniversary, and McEnerny-Ogle said that the city is looking to add a second bus rapid transit route in the future. She also said that the city is working to move forward on developing a day center to assist Vancouver’s homeless population. While much is happening inside the city of Vancouver, McEnerny-Ogle said that she hopes to foster good relations with Clark County as well as other cities in the county. “All of the county councilors impact us,” McEnerny-Ogle said. She explained that she wants to foster a relationship based on trust between the county and the city. Doing so will help ensure that relationships are already built when emergencies or disasters strike the county or the city. “We want that relationship and to have those conversations before the emergencies, before the disasters, before things get difficult,” McEnerny-Ogle said. As the new mayor, McEnerny-Ogle said that one of her primary goals is to help keep the progress she sees in the city going. She also said that she wants to make sure that she works with her fellow council members to help them address issues or projects they are passionate about. McEnerny-Ogle explained that she believes the biggest challenge currently facing Vancouver is the issue of homelessness. Affordable housing must be addressed as well, McEnerny-Ogle said. The need to fill the vacant council seat will also occupy much of the first weeks of McEnerny-Ogle’s term as mayor. “I think we will get a large number of individuals,” she explained, and while she has not yet discussed the process in depth with the other council members, McEnerny-Ogle said that her colleagues “have a diverse set of criteria” for what they wish to see in a new candidate. As she begins her time as mayor, McEnerny-Ogle said that she hopes to work through the challenges facing Vancouver with a positive, but realistic approach. “We’ve got a great community that we’re moving forward with,” she said.